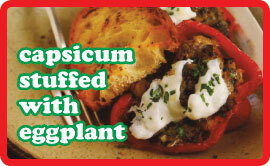 Or… Peppers stuffed with Aubergine if you’re speaking correctly. Anyway, these are delicious little starters or an side dish with chicken or meat. They’re very simple and look great. You can make them in advance up to the point of baking and just pop in the oven when you’re ready. Put the eggplant in a large seive, sprinkle some salt over and leave for about 1 hour. Gently squeeze the bitter juices out rinse under a cold tap and pat dry with paper towels. Add 1/4 cup of olive oil to a large frying pan, and heat over a medium heat. Fry the eggplant in batches for about 6-7 minutes until tender. When it’s all fried, mash with a fork to form a chunky puree. Add the egg, breadcrumbs, salt & pepper and basil. Stuff each capsicum piece equally with the eggplant mixture and arrange in a large lightly oiled roasting tin. Add a slice of mozzarella to each, a sprinkle of parmesan and a short drizzle of olive oil. Put 4 tablespoons of water into the roasting tin and cover with foil. Cook in the oven for 35-40 minutes. We ate them as they were without anything other than some toasted crusty bread which I rubbed with a halved clove of garlic.